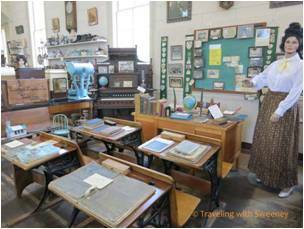 Are you teaching in a 21st century school with a 20th century (or 19th century) desk? Let’s face it; the teachers desk has not made many advances since the 1800’s. It’s time to rethink the role of the teacher’s desk in the 21st century classroom. Teaching methods have evolved beyond the standard classroom of students in desks and teachers lecturing – and so should the educational furniture to incorporate group learning, flexible classrooms, and increased teacher/student interaction. Today, instructors know that having the ability to “change” the environment helps engage the students and improves the learning process. They want a desk that allows them to instruct from anywhere in the room. We are fortunate enough to visit with schools around the country. In every school I hear very similar comments from educators, “I want the classroom of the future” or “I want a 21st century classroom”. Unfortunately, they usually end up with the traditional 30”d x 60”w metal instructor desk because it is “what we always buy”. The desk is not designed to facilitate the student interaction, personal items, and technology devices. Technology is a moving target and the teacher’s desk needs to have the ability to accept not only today’s technology but whatever technology is developed over the next 30 years. Instructors engage students in various places around the classroom, but there is still a need to collaborate with students at the instructor desk. Consider these three features when selecting your teacher’s desk for the 21st century classroom. Mobility and/or Flexibility – Decide whether mobility in the instructor desk is important. A quality furniture option can withstand frequent moves around the room or campus. Ability to Integrate with Changing Technology – Determine what technology the instructor workstation needs to house. A storage area can be built into the instructor desk to store equipment and provide access to wall outlets. This will keep the area neat by storing equipment, cords, and cables out of the way. Create a Collaborative Space – To foster a collaborative environment, consider the teaching style. Think about what type of instructor desk will work best in the room. This can include a desk with a meeting space, a lectern, or a combination of the two. Durability – The opportunity to design and purchase new furniture doesn’t come around every day. When the opportunity arises select a solution that is built to last and backed by a Lifetime Warranty. Are your instructor work areas stuck in the 18th century? The traditional rectangle teacher desk is truly a thing of the past. Education is moving into the 21st century. Visit the teachers desk section of our website to see our most popular designs. If you have a project, Contact Us, and let’s get started today. We will work with you over web conferencing and design the perfect desk for your application. See a real life story on how we helped Dickinson ISD in Dickinson, TX design their perfect teaching station.